Welcome to the heart of the Amazon rainforest and the Amazon Conservatory for Tropical Studies (ACTS). Located in one of the most biologically diverse forests in the world, ACTS serves as an open laboratory for tropical research, educational initiatives, workshops, and sustainable development projects. 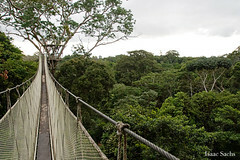 The ACTS Field Station and Canopy Walkway are located within a 250,000 acre preserve of primary tropical rainforest in the upper Amazon basin of northeast Peru. ACTS has one of the longest canopy walkway systems in the world, extending horizontally 500 meters throughout the tree-tops and reaching a maximum height of nearly 35 meters. This system of aerial platforms and pathways allows scientists, educators, and students to observe and study previously inaccessible parts of the rainforest. An extensive trail system through thousands of acres of primary rainforest is also available for exploration and discovery. The field station has rustic overnight accommodations, dining hall, conference room, research laboratory, and ethnobotanical garden. With access to all levels of the rainforest, it is an ideal site for both introducing and advancing tropical research and conservation. Formed in partnership with the non-profit organization, CONAPAC, and sustainable tourism operator, Explorama Lodges, ACTS is ideally suited to support a wide range of visitors including university researchers, field scientists, naturalists, educators, and students through a broad mission fostering field research, environmental education, and service initiatives.